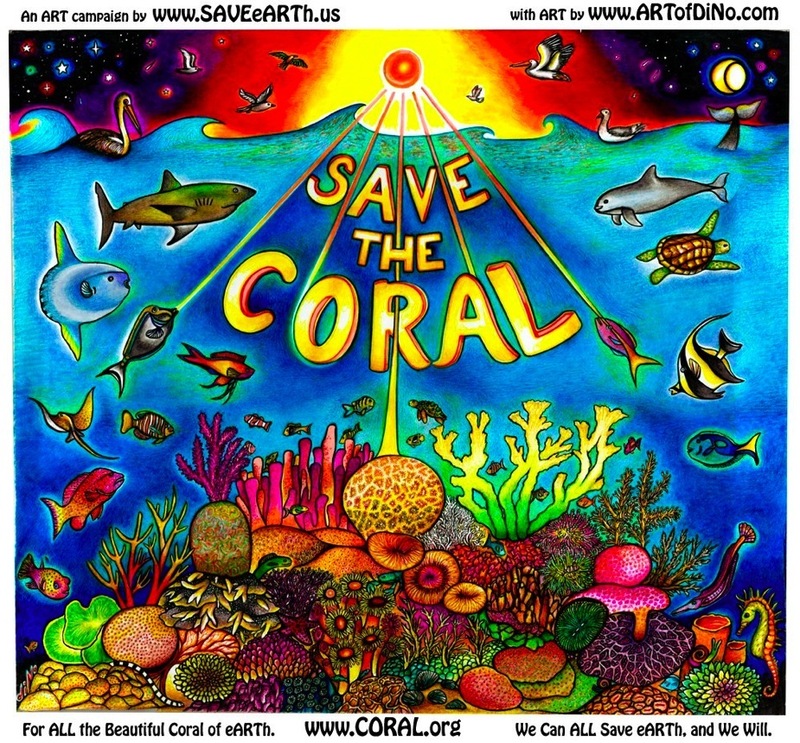 This Artwork features over 25 Coral Species that are listed by NOAA to be Critically Endangered. Contrary to what many people think, Coral reefs are living breathing beings, and they play an essential role to the ecosystems of Our World. Countless fish and sea creatures of microscopic to large size depend on the diversity, and health of the coral reef systems found worldwide. They are VERY Alive, and they often move in beautiful and mysterious ways variant on everything from the temperature of the water, the tides, and the phases of the Moon. They are miraculous beings and can form enormous colonies that have sustained, housed, and fed countless animals of the sea for thousands of years. Each coral is a delicate structure, with immaculate sensitivity to the conditions that it exists within. Everything from oil pollutants, plastic bags, sunscreens, boats, toxic chemicals, and so much more wreak havoc upon these corals, in nearly every ocean of eARTh. Education is important, because a Lot of people have no idea that their actions are in fact destroying the health of the Oceans. We believe and hope this Artwork can help to raise awareness towards the plight of Our Ocean’s Coral species. Everyone is capable of being positively affected by beautiful Art, and it can inspire generations to truly understand the potentially devastating situations that we face. We only get one chance to preserve Our Oceans, if we lose the coral, we lose the Ocean. If we lose the Ocean, we lose eARTh. Although it seems overwhelming... We must believe and KNOW..
that We CAN and WiLL Save eARTh.